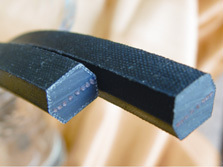 Double Sided V-belts also called as hexagonal belts. They usually transmit power from both of the belt. To meet the multiple bend and dual power requirements, D&D Double belts builted with special tension cords. They deliver maximum strength with minimum stretch. D&D HEXAGONAL belts are available in AA, BB, CC cross sections. Used on drives having one or more reverse bends as Lawn and Garden equipments, mixers, crushers, mule drives, agitators, conveyors. They have benefits of been dual sided classical profiles, hight strength tensile membres, oil and heat resistance, static conductivity.